I can assume it wasn’t my recipe you tried since I just posted it. 🙂 What was wrong with it? Did it not thicken or did it separate? Try this recipe especially if you have an immersion blender. I bet it will work. No one should be without mayo!! And no one should eat that store bought stuff either. Yum!! I’m excited to try a new mayo! I’ve been making mine with avocado or walnut oil, but am excited to try with coconut oil! I usually use my Vitamix to make, just blend on lowest setting and it turns out rich and creamy. I’ve never tried avocado or macadamia oil. I have heard they are great in mayo. I saw them in Whole Foods and they were ridiculously expensive. I have a vitamix. I should try it in there sometime. Thx for stopping by. 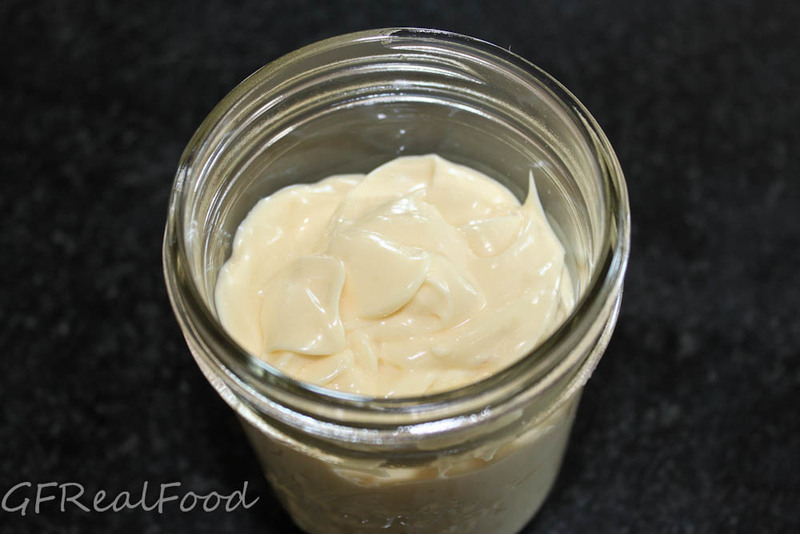 Hrm, I tried a half olive/half coconut oil mayo a couple weeks ago. Turned out very stiff and downright hard after chilling in the fridge! Maybe I needed more oil, but it was my first attempt at homemade mayo. I used 1 cup of oil and 1 whole egg with a teaspoon or two of mustard. It tasted good, just had this dry hard texture. Who ever heard of hard and dry mayo? Ya, hard, dry mayo does not sound good at all. I wonder why that happened. That’s never happened to me. We use the same amount of oil…. Try again??? This is similar to the recipe I’ve been using, but mine has Dijon mustard and just one whole egg. It doesn’t have the nice “eggy” flavor of Hellman’s so I’m trying yours. I make it in my food processor, pouring in the oil VERY slowly, and it always come out perfect. Another good oil to use in place of the EVOO is Hi-Oleic Sunflower Oil (http://www.vitacost.com/Spectrum-Organic-Refined-High-Heat-Sunflower-Oil). It’s very neutral tasting and very low omega-6. I have to leave out the whey as I tested very allergenic to it. 😦 Will let you know how it turns out. I would have never though to make mayo with coconut oil. Out of curiosity – do you heat the coconut oil some? My coconut oil is fairly solid (i.e. not pour-able) at room temperature? I get you want to avoid cooking the eggs. Yes, it definitely has to be liquified. I live in Arizona so mine is liquid at room temp. And yes, I would warm it to liquid but not so warm that it would cook the eggs. Good point. I should clarify. Thanks. I’m going to try with ghee and olive oil in my blender. Wish me luck! That sounds really good. Let me know how it turns out. Good luck! I live in AZ also ! What are you calling an immersion blender? Is that the “boat motor” that you can put into a pot of soup to blend ? Yes hats the one. It is long and skinny. Where in Az are you? Thanks for letting me know how it worked out for you. Glad you liked it. That’s great. I’m so happy to hear it worked out for you. Reblogged this on Gluten Free Real Food. One question: exactly what kind of whey can I add to extend the “shelf life” of the mayo? That clearish liquid that settles on top of yogurt is whey. I buy a high quality plain yogurt for this if I’m not making the yogurt myself. Better yet, strain the yogurt through cheese cloth and you will get lots and the left over yogurt is so awesomely thick. Okay, I added the 2 T. whey and it’s sitting out on my counter for 7 hours. One question: the mayo seemed quite thin and pourable. Will it thicken up in the fridge? It tasted fine. Yes it will thicken some. Did you use an immersion blender? Most times mine is super thick from the beginning. Next time blend more and pour slower. You know, I tried an immersion blender once before (NOT your recipe) and it turned out awful! I usually make it in my food processor and it’s perfect…..but I realize that your recipe has more liquid with the 2 extra egg yolks (though the other recipe had 1 T. Dijon mustard). Your recipe has flavor closest to Hellmann’s–mmmmmmm—so next time I’ll try the immersion blender. Thanks! 🙂 Besides, if it stays too thin I’ll use it for a dressing with my BLT salad; simply add some dried dill weed and sweet paprika to the mayo, pour over greens, cooked bacon, chopped tomatoes and cheese. Delish! That sounds so good as a dressing. Great idea. When I made this in my food processor it was thin like you describe. But I’ll keep dressing in mind with this as a base done in there. Thx!! I made this last night- followed the directions to a tee. I took it out today to use and it was really hard (not spreadable at all). Any idea why this might have happened? I had to melt the coconut oil first when I made it, so it’s almost like to coconut oil re-solidified. Hmmm, I’m not sure why that would have happened. It did however happen to me once too. Again same recipe. Maybe try next time with more olive oil and less coconut oil. Sorry I can’t be of more help.